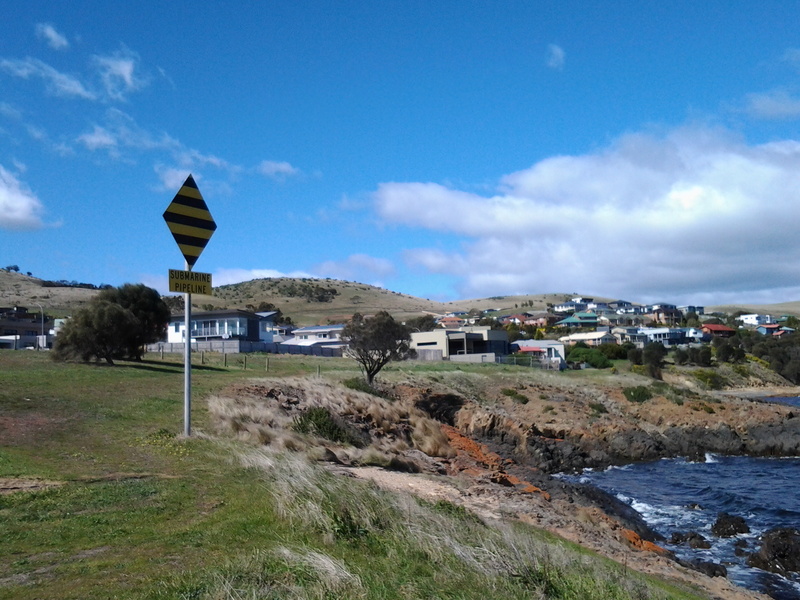 Leaving the Derwent River edge, I walked up the concrete path to Vaughan Court in Tranmere, turned left, walked until I reached the T junction with Oceana Drive, turned left and then followed the suburban footpath back in the direction of the original bus stop. From the bottom of the concrete path until I reached that bus stop, it took approximately 15 minutes. I turned left down into Tranmere Road. Three minutes later, when I reached Pindos Drive, a No Through road, I turned left and followed it to the end and arrived at midday. This road ending named Tranmere Point, is marked by Pindos Park, an area with children’s play equipment, seats to admire the views, and places to enjoy a family picnic. Locals were walking and cycling. I looked southwards and could see that Pindos Park was another possible starting place for a walk to Trywork Point. 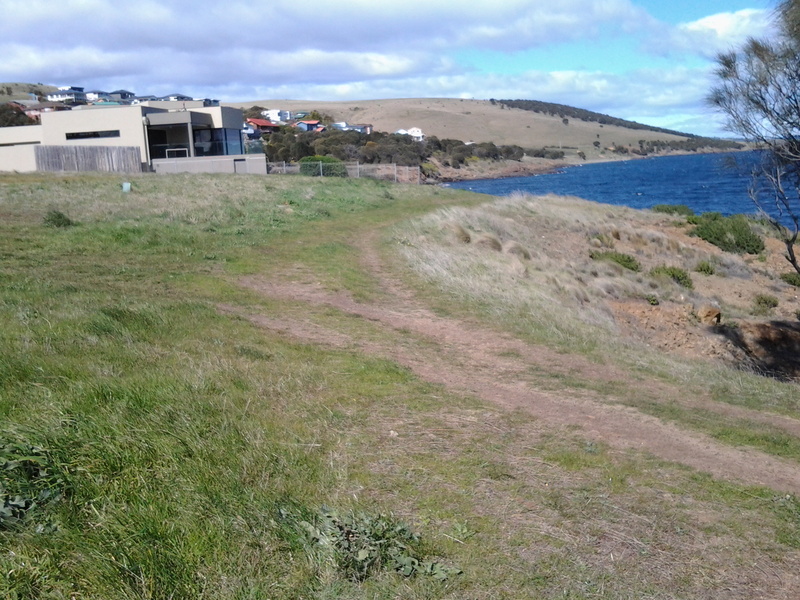 The soft grassy track between the houses and the River was wide and clear and continues around until a connection is made with the track to the gate at the beginning of the small pebble beach. This photograph is taken from the Pindos Park area. The trees on the hill in the distance are the forest of Casuarina trees I referred to in an earlier posting. I walked though those trees in order to reach the other side and then down to Trywork Point. What I am now suggesting is the walk to Trywork Point starts here at Tranmere Point and the track visible in this photograph can be followed eventually down onto the rocky shore and then around the bays and small headlands. In this way, walking on private land can be avoided. and continued on following the River into the sun. I could see the suburbs of Howrah and Bellerive with their golden sandy beaches in the far distance. Ten minutes later I reached the official start of the Clarence Foreshore Trail, a cemented path for both cyclists and pedestrians. By 12.15 I reached bus stop 32, and five minutes later I arrived at bus stop 31. 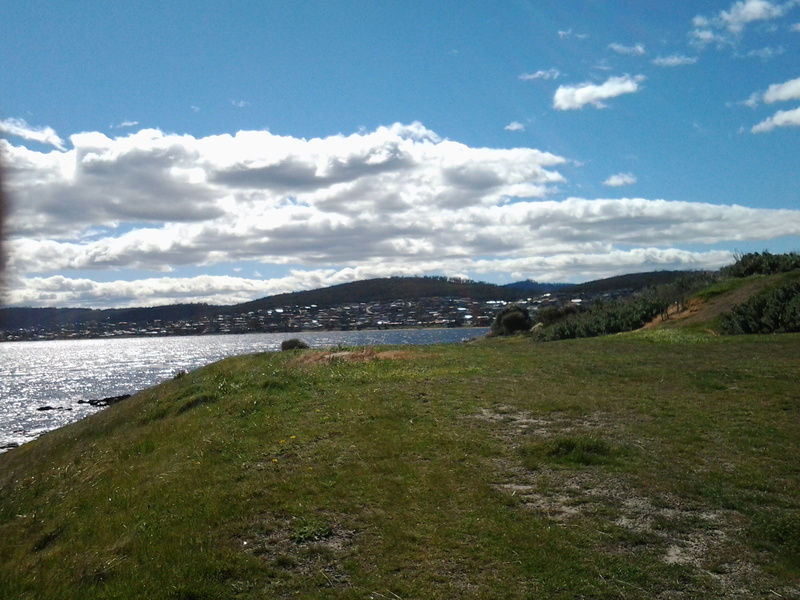 However I was beginning to plod because my feet were sore so I waited for a few minutes by the rocky foreshore of Tranmere in the glaring sun amidst a stiff wind, for the 12.23 pm bus which was scheduled to return to Hobart. It came on time, and when I hopped on and sat down I realised that I had not stopped or sat since the bus trip to Tranmere 3 hours earlier in the morning. During my walk, I hadn’t stop to have a morning tea snack – hadn’t felt the need. Was enjoying the scenery and the weather too much to consider food. Lost in all the gorgeous moments of the day. I left the bus at the Shoreline shopping plaza for a toilet stop and a chance to buy a newspaper and a few groceries. 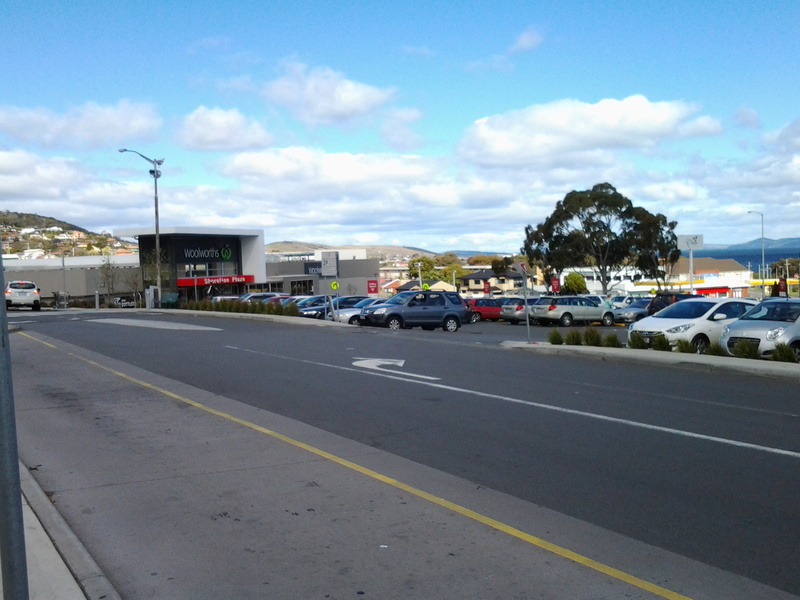 Note that in this photograph taken outside the Shoreline Plaza, there is a distant hill in the centre background. That’s the hill with the Casuarina trees through which I walked on the way to Trywork Point. The Shoreline was very convenient. Then I jumped on a later bus heading towards Hobart. 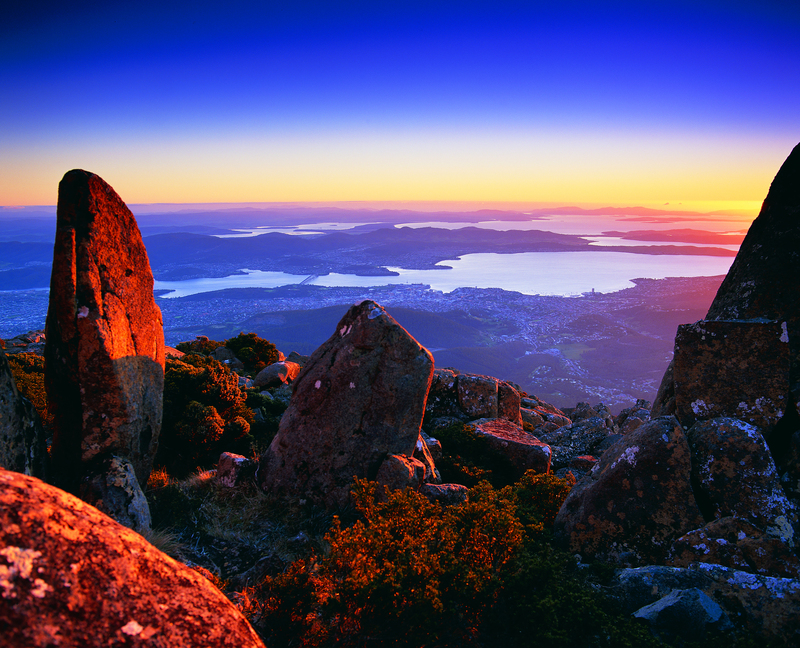 This entry was posted in Derwent River, Hobart, Mount Wellington, Walking and tagged Casuarina trees, Clarence Foreshore Trail, Derwent River, Hobart, Pindos Park, Shoreline, Tranmere, Tranmere Point, Trywork Point on September 20, 2014 by Tasmanian traveller.